Look at me getting all fancy with condensation in these photos! Sorry for the sporadic posting schedule, as of today things finally calmed down at my day job so we should be back on track. 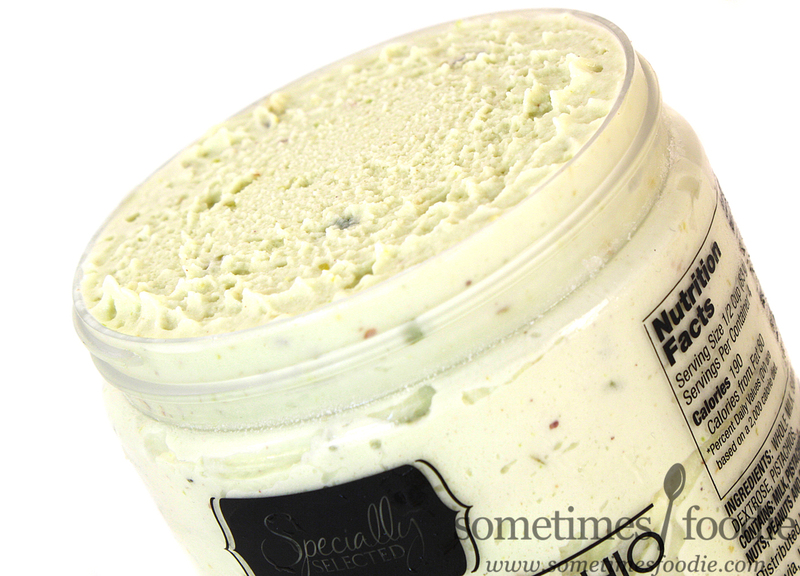 The container is made of clear plastic which allows you to see the ice cream inside and all it's mix-ins (like little pistachio pieces). This kind of packaging allows the product itself to really shine and provide a POP of color, because other than the product itself, everything else is in black and white. (Technically black and silver, but you get what I mean.) The labeling is minimalistic, using bold but simple black illustrations and simple sans serif text, which looks really sophisticated. (Especially for Aldi.) We have a simple, somewhat minimalistic design featuring black ink, but when the silver lid catches the light it gives this product and flash of fanciness that you just don't get with Talenti's brown plastic screw-top. (Although their logo and overall design is a lot cleaner and much better technically.) Still, this is a pretty nice container, I just hope what's inside tastes as good as it looks. I twisted the lid off, removed the circular white paper seal from the top of the container, and dove right in. After scraping off a decent spoonful I popped this into my mouth and I fell in love. It's not as creamy and light as the gelato I had fresh from the cart in Italy or Austria, but it's much better than most of the pretenders we have here in the states. 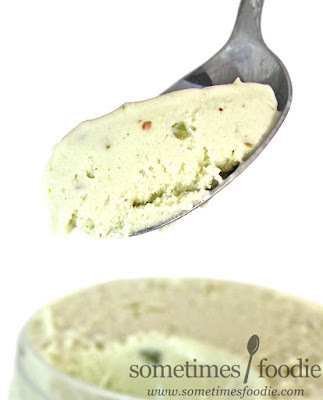 The gelato has a light but creamy texture, with a true pistachio flavoring, and the little pistachio bits are just the right side to add a little crunch and buttery nutty flavoring to eat spoonful. I've had Talenti's Sicilian pistachio gelato in the past, and even though I don't have it here to do a true side-by-side comparison, I feel confident in saying this is the exact same product, just in a different container. I'll have to contact the guys at On Second Scoop (who are celebrating 8 years of ice-cream food blogging! Congrats!) to let them know about these gelato-y developments. FYI, I ate this entire container in two days. Solo. My boyfriend was sad I didn't share when he saw this in the recycling. Hi! I did you do the vanilla yet?! imho it is far superior to Talenti. 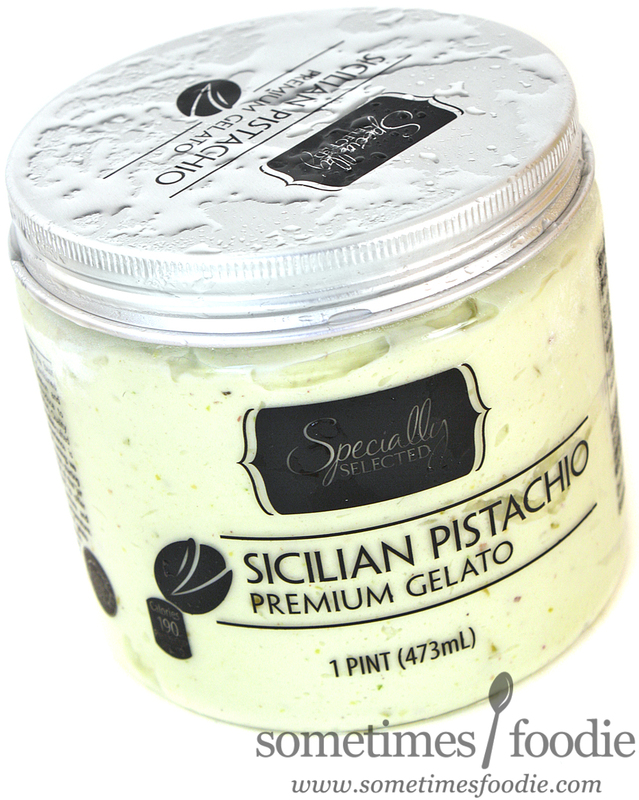 I also think the aldi pistachio is slightly better than Talenti. Taste and most definitely texture. I LOVE this product!